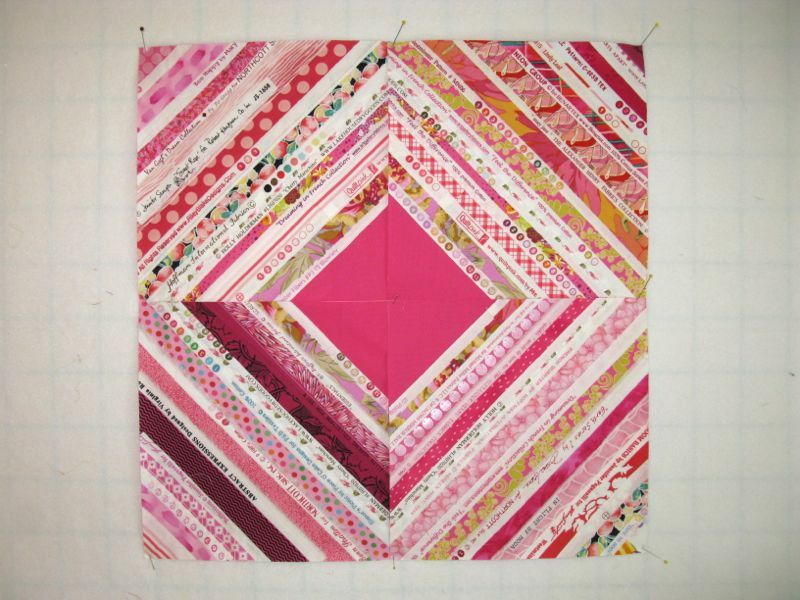 Straighten Up and Sew Right | OccasionalPiece--Quilt! 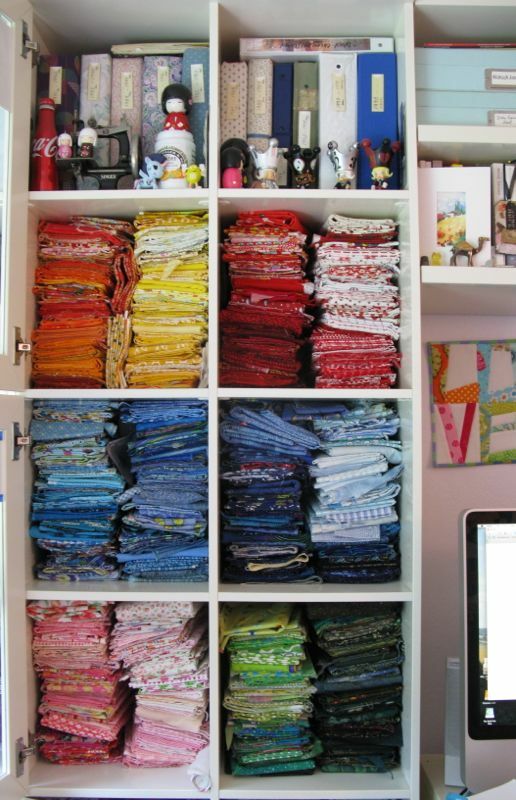 Posted on August 21, 2014 by Elizabeth E.
I like to organize mine by color and value (light-to-dark). The lower half of the cabinet. Inside the pull-out box are browns and blacks–easier on the back this way. 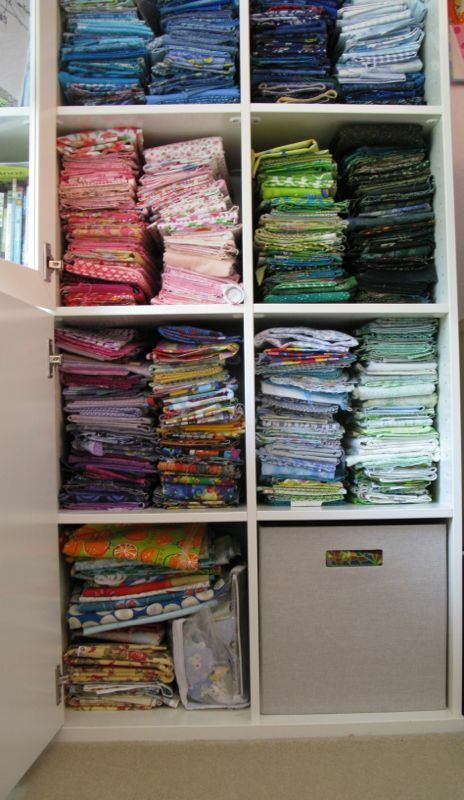 I keep the Kaffe Fassets in another place, and I also have a stack of cream/tans and a stack of “low volumes” (neutrals or pastels), and stack of predominantly white/light background fabrics. 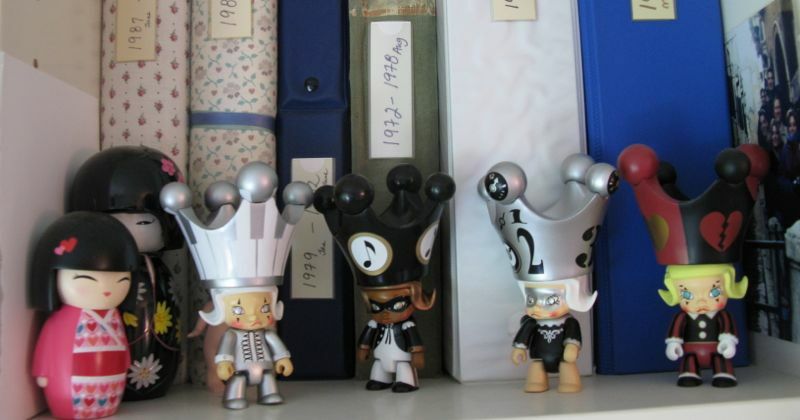 Here’s a close-up of my Molly Qee collection (the characters with the crowns). They are hard to find in the States. I started my collection when my sister Christine and I happened into a collectibles shop in Lyon, France. And on the other shelf are other doodads. 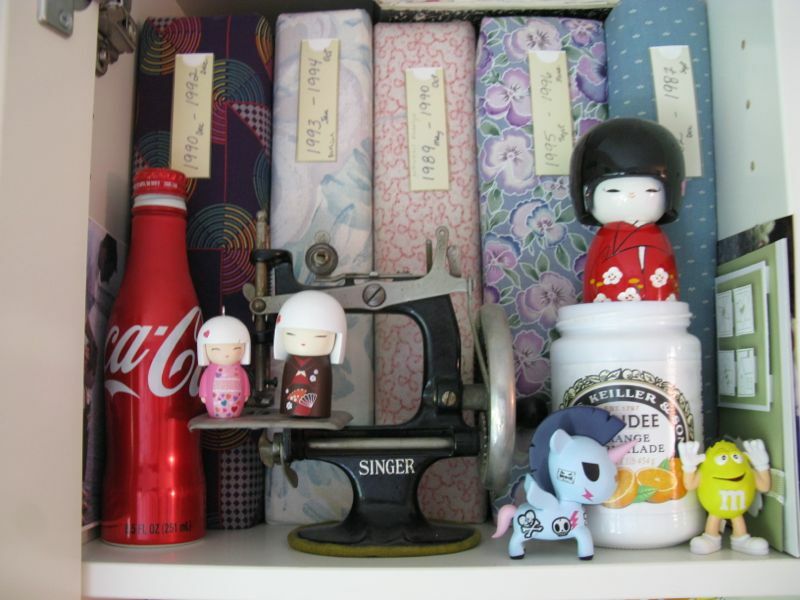 My husband gives me the little Japanese dolls (ningyō). And those fabric-covered binders are all my journals, began when I was a young woman of twenty-one years old. Since the advent of email and cheap phone calls, I’ve stopped writing them, but I love having them around (they hold all my secrets!). So after a busy month, I pulled out the machine and got started. I decided to ease my way in slowly, making a selvage block. 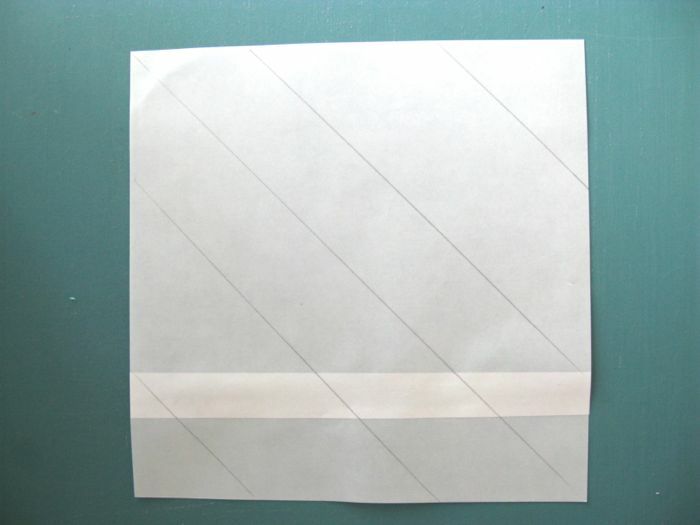 When I begin, I use my standby translucent paper, cutting, then pasting a strip on one side so it measures 10 1/2″ square. Then I draw lines on it to keep the selvages on straight. Do I cut all my selvages off when I buy fabric? No. I like having them on to keep track of the newer stuff in case I need more. 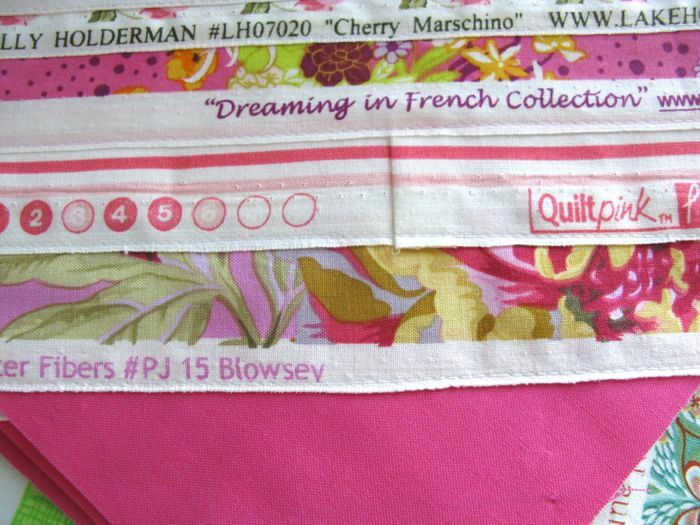 Most of these selvages happen when I’m going through older fabrics that are in my stash (like those to be donated), of which I know I’ll never need the information again. 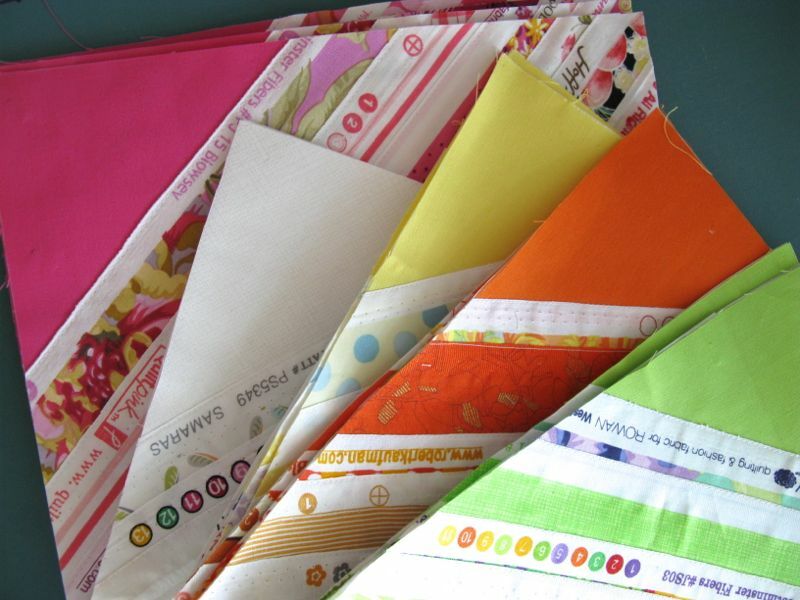 Then I slice it off, leaving about one-inch to 1-1/2″ of the fabric on top of the selvage so I have Lots of Options. I get started by cutting two 4 1/2″ blocks, then slice them on the diagonal to make up the four triangles you see in the center above. I pin them down, then start sewing on the selvages, placing the selvage edge 1/4″ in from the raw edge of the triangle, as shown. Sew closely along the edge. I like it best when the first selvage next to the color is the same, or nearly all the same, so I look for a longish piece. I think it just helps set the stage. Sometimes I piece selvages to get the printed symbols and the words closer together (above) and other times I just let it be. Then it’s random, random, random after that, some thinner strips, some thicker strips. Some people like to trim the fringey pieces, but I just leave it that way. Sometimes after I sew on a strip of selvage, I’ll go in and trim down the underneath piece just to keep it tidy. Sometimes I get things off balance, like in the pink block way above (too much deep maroony-pink in the lower left) but then I figure I’m teaching myself how to let go a bit and just enjoy the process. And I do. I now have five colors of four 10″ (finished) blocks, so the block will be twenty inches square after all four parts are sewn together. This is going to be one big quilt, but I’m in no hurry. Go tackle something incomplete, and enjoy the power of taking another look at something that in our hands, has had a long journey. You are my favorite writer. The end. Just what I needed. Also, I wholeheartedly agree with liveacolorfullife. Tackling the incomplete- that’s the perfect way to say it! I was struggling with a couple of projects before I went away, but when I came back one seemed new again and the other I had found a solution for! I guess they just needed the time apart too! What a great post! I know what it is like getting back to the sewing machine after a hiatus. Need to get back to mine, yet again after all the hand quilting I’ve been up to. Loved the tutorial on your selvage project, looks great!! I never heard of doing a selvage block before! But it’s a fun idea and certainly looks great when finished! You know that I love those selvage blocks!! What fun that will be! Ditto Cindy’s remark. Always love your writing. These are absolutely beautiful. I am loving the way the colors are going. It will be fun to see your progress. Is your ‘sewjo’ coming back at all? I love the look of your selvage blocks but doubt I will ever want to make one. I keep the selvages and usually cut them off with WOF cuts, bit by bit. I am not a selvage saver, but I really do like your blocks!